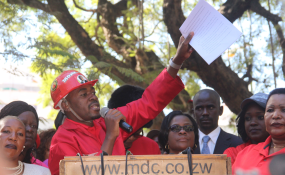 Mutare — MDC Alliance leader Nelson Chamisa has reiterated his determination rename the country to Great Zimbabwe. Chamisa is the opposition alliance's presidential elections for elections scheduled for July 30. Addressing thousands of party supporters at Sakubva Stadium Saturday, Chamisa said the country's name has been ruined by the ruling Zanu PF party. He has also indicated, in previous campaign rallies, that the country's provinces would also be named. "The first thing which should be done under our economic transformation agenda is to change the name of the country. "Zimbabwe cannot remain Zimbabwe because it has been turned into Zimbabwe ruins." He added "We will be renaming it to Great Zimbabwe in line with the greatness which is coming. We are a great country. "The name Zimbabwe is cursed as you can see our national soccer teams always loses matches; cricket team is always defeated, volleyball is always defeated." The MDC-T leader said there is need to rebuild the battered image of the country and restore Zimbabwe to its former glory status. "Even in the bible when you are getting to a higher level you are given a new name which is Great Zimbabwe," he said. An MDC Alliance government would also change the functions of the country's cities. "Harare will remain the capital city, but we are now moving government business government to Gweru in Midlands which is central to everyone. "People will travel from here to parliament and government offices in Midlands. "Mutare will be hub of industry in areas such as tourism, horticulture and tourism. We want to revive Kondozi Estate to its former state." He added; "We want to address the devolution agenda. People should not travel to Harare to apply for passports. "A passport should be instant, and people should not have to wait for a long period to access a travelling document. This is not acceptable." The rally was attended by thousands of opposition supporters.